Gadhafi during happier times. And alive. Reports began surfacing in the early morning hours on October 20th, 2011 that something was up with Moammar Gadhafi. With news stations stumbling over themselves to break the story, wild and varied reports came in from all over the planet. Then, the president spoke. "Moammar Gadhafi is dead. Libya is in good hands." There is nothing more ridiculous in our modern age of news reporting than when sources try to break a story. This can only be topped by a bunch of bloated holiday shoppers storming the doors at Wal-Mart on Black Friday. In either case, someone gets crushed. Reports came in that Gadhafi was found spray painting graffiti in a sewage pipe. Then he was shot in one leg. No, he was shot in both legs. The group that found him and shot him or found him shot was taking him to the hospital. Now, the story changed to just one shot in the leg, but he was being paraded around down a street, where he may have been shot again, in the other leg. Reports arose that he was dead - no cause of death. But another report said he was shot in the head. Not knowing how he died, another service said his body was being dragged through the streets. I'm still doubting the report that an apple was shoved in his mouth and he was put on a spit and served with traditional Middle Eastern mint jelly. What we can deduce from all of this is that Moammar Gadhafi was brutally killed. His crispy corpse was taken to the authorities where he will be tried and probably sentenced to death, again. Or they may cut off his head and feature it on a Saturday morning kid's show on Al Jazeera. This method of justice is very different than what we have in America, but president Obama said, "Libya is in good hands." What better hands to be in than to shoot, torture, kill and drag a body through the streets. Those are the kind of sensible people we hope take over the helm in Libya. They're fast, efficient and saved the government a lengthy criminal trial. 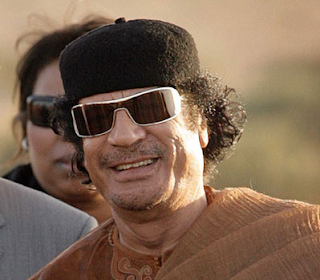 Now, all that needs to be done is auction off Gadhafi's extensive wardrobe of fabric wraps, sunglasses and cool little caps. For years, we support these dictators, change our mind and hope they get ousted; and then welcome in a raucous band of rebels in hopes that they'll make things right. With all these unknowns, we can only take solace in the fact that Gadhafi was not buried at sea. We've seen a lot of change in the Middle East, but will it be change for the better? Are the new guards better or worse than the previous regime? If the Muslim Brotherhood gets their foot in the door, you can bet against improvement. Only time will tell if the Middle East will find true democracy and freedom for its people. For now, Moammar Gadhafi is dead and Obama says, "Libya is in good hands." Renegade Obama | Why Are We Attacking Libya?